Food trucks: magical capsules of iron and rubber wafting delicious and beautifully foreign smells from their insides, which tease our noses and prompt our mouths to water. Heaven? These babies are pretty close to it. What Is A Food Truck? Food trucks are vans or trucks that are modified in order to accommodate a kitchen and all of the items that accompany it- stove, oven, grill, deep fryer, microwave, etc. They may be moved from place to place (they are vehicles, after all) or simply occupy a designated spot on the street. Food choices range from traditional and simple foods like hot dogs and tacos to much more unique recipes including ethnic cuisine and gourmet options. While the idea of mobile food wasn’t born yesterday, more and more cities are beginning to adopt the creative idea. Cities such as New York, Los Angeles, D.C., and Chicago are no strangers to the food truck phenomena, where grabbing a bite from a food truck is considered a fashionable norm. Let’s take a look at how exactly the food truck empire was born and how it’s gained popularity through the years. People in the 1860’s used chuck wagons as a means to carry food and cooking supplies across the US and Canada. What’s a chuck wagon, you ask? It was a modified wagon with special compartments designed to preserve food for a longer period of time. The chuck wagon also had a special back flap designated for storing firewood. When the flap was laid over a fire, it provided a cooking stove. Traveling cowboys and cowhands were able to cook food wherever they traveled, which proved very useful. Over the years, food trucks became more prominent; the name “food truck” began to stick in peoples’ minds more than any other name the mobile wagons had. Businesses like the Salvation Army and the Federal Emergency Management Agency (FEMA) started to use food trucks in order to feed people in post-disaster communities, as their houses and any other form of shelter was most likely destroyed in some way. “Roach Coaches,” a nickname for a food truck, provided fresh food on site to construction workers and farm workers alike. In rural areas, particularly in the 60’s and 70’s, food trucks were loaded up with locally grown produce and garden products and driven to busier commercial areas to sell their goods. Today, food trucks have evolved and become so diverse, it can be quite difficult to choose what to get- even more so if you’ve only got a 30 minute lunch! Back in the day, it was obviously quite common for the food trucks to drive to your location. Nowadays with mobile apps like Facebook, Twitter, and Google Maps, all you have to do is search for where food trucks park themselves and go to them, depending on where they are for the day, week, or month. Food trucks are worldwide, too: In Canada, lunch and coffee trucks provide items for people to buy throughout their workday. In Asian countries, food trucks provide the unemployed with a source of income, as out of work cooks and bakers load up trucks with prepared food and other food ingredients that can be easily and quickly prepared upon order. Snack trucks have also become increasingly popular in the United Kingdom, where the vehicles frequent universities and other areas with high traffic. 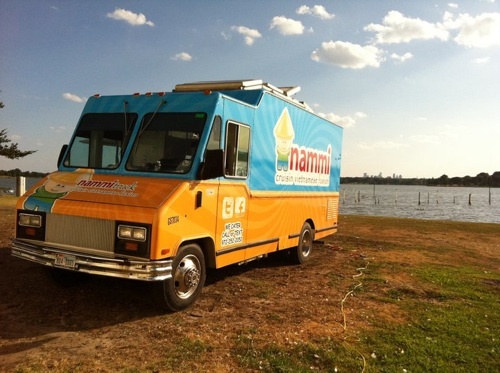 If you’re the adventurous type looking to travel the country with your food truck in tow, this business is definitely for you. The above traits are necessary in order to prosper; just sprinkle in (a lot) of fun and make food people can enjoy, and Voila! Food truck success. Kim Olsen freelance writes online and covers a wide variety of topics from business degree programs online to business startup tips and business technology developments.